Transformational Power Yoga Flow Foundations Course for Waiheke Island! 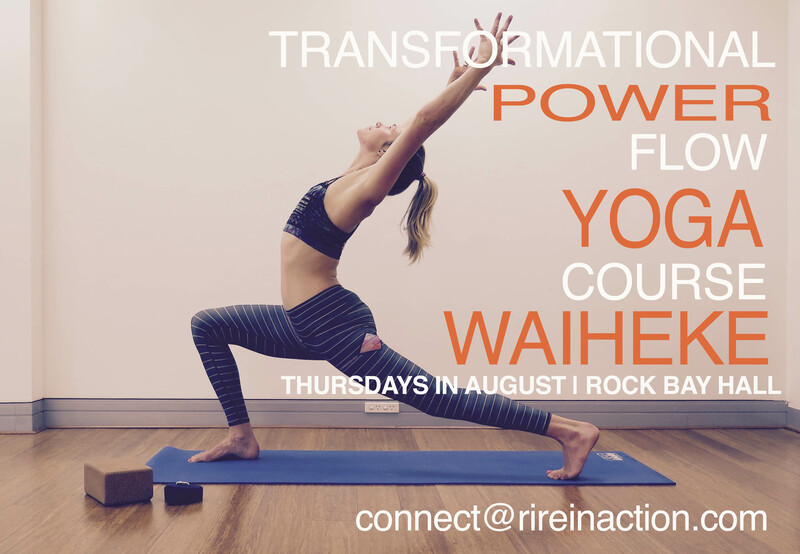 I’m thrilled to announce my Transformational Power Yoga Flow Foundations Course for Waiheke Island! This course is for those who want to get more out of LIFE! Let’s face it. It’s hard to get out to a yoga class especially on Waiheke, with kids and family commitments. We all know yoga has the ability to bring incredible benefits to our mind, body and souls, yet one of the biggest challenges lies in developing and maintaining a home practice. A regular power-flow practice can not only bring more zen into your life, but it can also help tone and detox your body while targeting trouble areas like leg and back tension; it also firms the glutes, core and arms, AND after just 30 – 40 minutes you will break a sweat and feel like you’ve had a decent work out. I teach a modern style of yoga that blends exercise physiology making it a safer, and sometimes a more comfortable practice! It’s a common sense approach to ancient yoga teachings. Our western bodies are different from typical Indian yoga folk, so we aim to work from the basis of maintaining a neutral spine, and softening other parts of the body until we can build the strength and balance to take the practice further. It’s also about honouring the unique physical make up of each individual, so this practice can be for every-BODY. It’s time to Move, Breathe & Sweat, and of course HAVE FUN! Each week we will flow through the sequence to a vibing playlist, then we will use the remainder of the time to workshop each posture with correct alignment, also focusing on transitions in and out of each pose. Limited Capacity – Don’t Delay!